What can I say? There are some aspects that seemed quite derivative - or perhaps homage. There are many things that just whisper in your ear "Lord of the Rings". Definitely a shakey start to the series. It does improve as it goes on, just enough that I decided to read the next book. 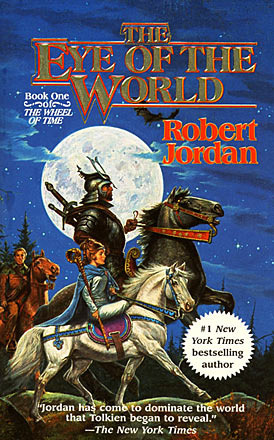 I think Robert Jordan finds his voice and story. Enough to ensnare me, my course is set on reading the series now. One of the things that persistently annoyed me over the course of the first few books was all the dreaming/visions. Often, you don't really know what is happening or if it is happening - it sometimes seems like superfluous fluff. The story is good when things are really happening and characters are actually interacting. Sign into Goodreads to see if any of your friends have read The Eye of the World.